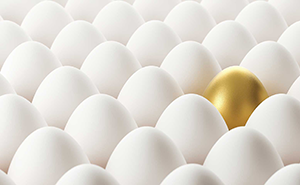 This is the first in a series of articles based upon the new book, Executors, Trustees & Beneficiaries: Honoring The Intent, The Law and Emerging Trends from the Institute for Preparing Heirs. This Q&A book offers new thinking and new tools designed to expand the family wealth conversation beyond the legal and fiduciary responsibilities of executors and trustees. This book introduces families and their trusted advisors to new inheritance conversations that give meaning and purpose to family wealth, and gives new insight and guidance to professional advisors in preparing wills and trusts. It explores the relationships between the asset builders, their trusted advisors, those chosen to be executors or trustees, and the beneficiaries who ultimately benefit. We begin this series with what wealth builders need to know before drafting their wills and trusts, choosing an executor and/or trustee, and naming beneficiaries. 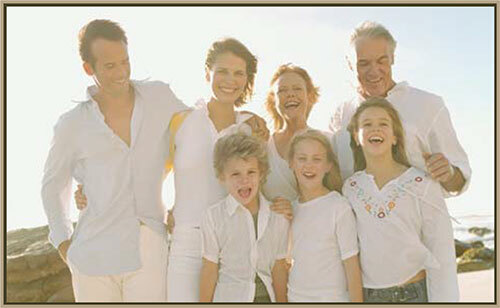 Rarely does a family break apart post-estate transfer because of errors in the estate documents. How can a will or trust be used to improve a wealth builder’s odds of a successful wealth transfer? It begins with families thinking—and talking—about its wealth in a much broader context than just the money. Before the estate documents are drawn, families need to have new inheritance conversations centered on the meaning of “family” and purpose to the family wealth, considering the broader definition of wealth above. The entire family, including spouses, should participate in drafting a Family Wealth Mission Statement that contains members’ shared values and agreement upon how the wealth is be used today and in the future. This Statement is helpful for advisors to ensure the wishes of the wealth builder’s family are honored when drawing up wills and trusts as well as providing insight to future executors, trustees and beneficiaries. “During a portfolio review meeting, Katherine L., a financial advisor, asked her clients if they would mind helping her fill in their family tree, including the names of all of their children and the children’s spouses and children and grandchildren as well as the clients’ parents. She also asked for the names of their executor and trustee along with the family’s other trusted advisors (estate attorney, CPA, insurance advisor). She even included the names of the family pets! Katherine explained why knowing the members of their entire family and its advisory team would help her serve them better. She made them aware of a few of the pitfalls other families have faced while transferring assets to unprepared children, grandchildren, and other family members—pitfalls that had little to do with the estate documents. … Katherine offered books and articles on the topic for family members to read and discuss in a family meeting setting. . . . The next article will look at the role of executors. 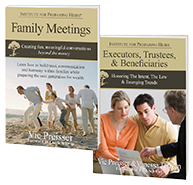 Pre-order copies of Executors, Trustees & Beneficiaries by Preisser and Terzian for you and your client families.